Intel will not be supplying Apple with radio chips in a future iPhone release, a report claims, with the chip producer said to have stopped development of parts that would have enabled 5G cellular communications on an upcoming version of Apple's smartphone. Apple has reportedly notified Intel of its decision to not use its modem in a next-generation iPhone model, internal Intel communications and sources familiar with the matter advised to CTech. It is believed the decision affects iPhones that will launch in 2020, and not those destined for the 2019 refresh. Intel had been working on a chipset called "Sunny Peak," combining a 5G modem with Wi-Fi and Bluetooth radios, which Intel was producing with Apple in mind. 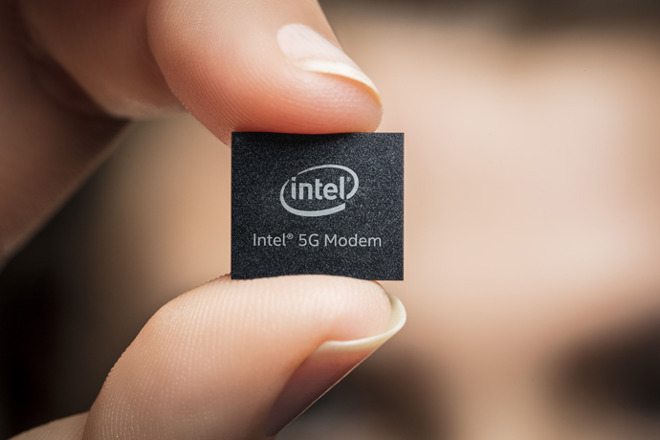 Company executives were apparently anticipating Apple would be the "main volume driver" for the part, but following Apple's notification, Intel has redirected the team's focus to other 5G-related projects. Despite not gaining approval for Sunny Peak, Intel's executives believe the chip producer can still improve the component, potentially for Apple devices launching in 2022. It is unclear why Apple opted not to use Sunny Peak, but the internal documents speculate it was the result of "many factors." The introduction of the WiGig Wi-Fi standard, which would have formed part of Sunny Peak, is said by executives to bring "new and unanticipated challenges" to mobile devices, and could have contributed to its downfall. While the report concerns the Sunny Peak project, it does not necessarily indicate Intel is being cut out of the supply chain completely. Intel is currently providing modems to Apple alongside Qualcomm, but reports suggest Apple is altering the split of supply to 70:30 in favor of Intel for the 2018 fall refresh, with a view to moving away from Qualcomm modems completely by 2019. As Apple is in an ongoing legal battle with Qualcomm over royalties, there are relatively few alternate options for Apple to move towards if it intends to support 5G in its future iPhones, aside from Intel. One option could be MediaTek, which recently unveiled a new 5G modem chipset and is said to be trying to supply Wi-Fi chips for the HomePod as a stepping stone towards becoming an iPhone modem source. Update: "Intel's 5G customer engagements and roadmap have not changed for 2018 through 2020," Intel advises in a statement provided to AppleInsider. "We remain committed to our 5G plans and projects."